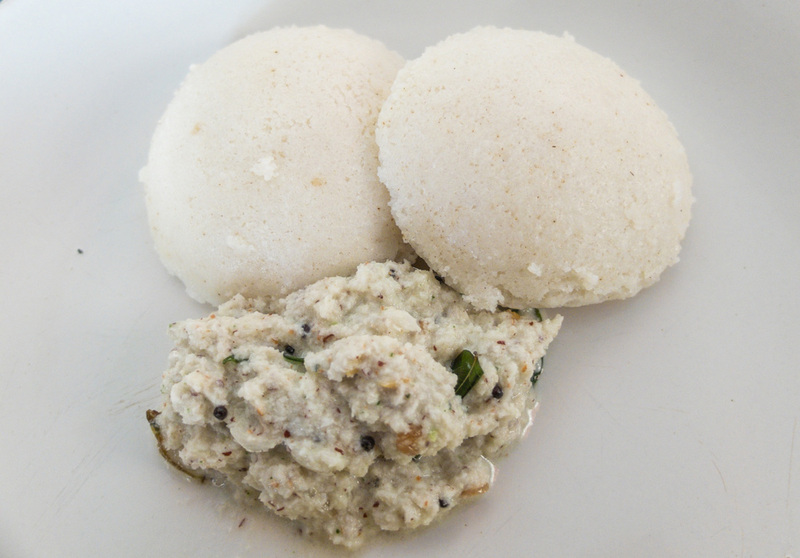 Idlis, a traditional breakfast in south Indian households, are steamed patties made of fermented mixture of rice and mung beans. This is a homemade from-scratch recipe, although one could save some time buying rice and bean flour rather then making it at home (of course, in that case, I cannot guarantee the final result). Idlis are usually served in pairs with chutneys or sambar. Chutney is a kind of sauce that can vary in density and texture, usually based on fruit, vegetables or spices. It is condiment for main dishes with rice, meat or vegetables - a sort of relish, if you like. 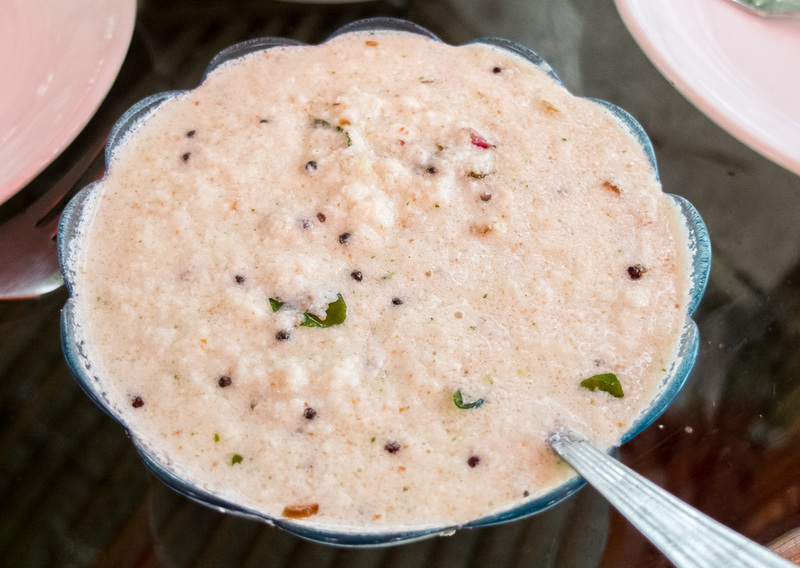 In this recipe, we propose an aromatic and slightly piquant coconut chutney (degree of tanginess depends on how much you love the chili). It 's really delicious for breakfast, or for any other time of the day really. We immediately fell in love with it. Try it! It's also great served with dosa. Wash the rice well and leave it to soak for 3-4 hours, water should cover the rice by an inch. After ca. 3 hours, and when the rice has absorbed the water, put to soak the de-husked black lentils for about 30 minutes. When done soaking, put the black lentils in a mixer, add another cup of water and mix it for about 10 min, so as to obtain a soft and foamy mixture. Then do the same with the rice, this time though adding more water (1-2 cups) and mix it for about twenty minutes. The result, once again, has to be a soft and fluffy mass.Then put the two mixtures together and season with salt. The batter should be soft and fall easily off the spoon. Leave the idli batter to rest for 6-8 hrs in a warm environment (it must ferment). You can also choose to prepare it the night before and leave to stand overnight. Remember to use a bigger container as the batter will grow in volume with fermentation. 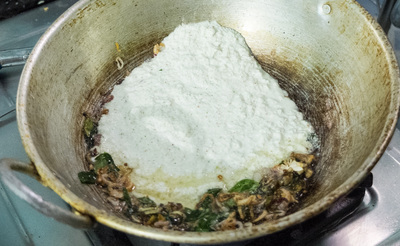 Before cooking, stir the batter again (because the mix of beans will tend to rise to the surface while the rice, being heavier, will sink to the bottom). Finally, shape the idlis and steam cook them for 10-12 minutes. PS: the dosage is for ca 30 pieces. Warm coconut oil until hot and then throw in the mustard seeds. 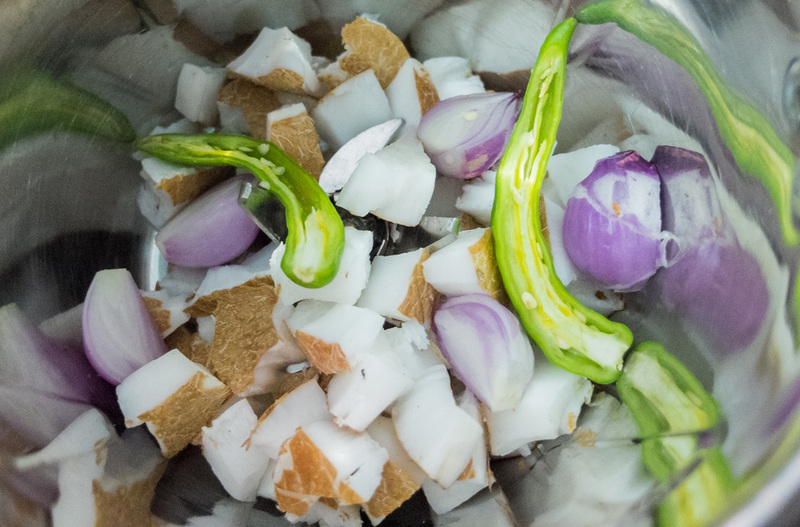 When they start to crackle, add the ginger cut into small pieces, the finely sliced ​​shallots and curry leaves. Sauté well until the shallots turn golden brown, then add the grated coconut masala and more water if needed, until you get the right consistency.